The former US Defence Secretary, Donald Rumsfeld, famously warned that in any situation there can be known knowns and unknown unknowns, the latter being the most potentially dangerous as they are "things that we don't know we don't know". But missing from his list were the unknown knowns, the things we know, but don't realise that we do. The power of such knowledge - things we perhaps can't recall ever learning, but use all the time without thinking - has been illustrated by, of all things, the popularity of a tweet about the correct order in which to use adjectives. The tweet by Matthew Anderson, the editor of BBC Culture contained a screengrab from a 2013 book "The Elements of Eloquence: How to Turn the Perfect English Phrase", and has been retweeted many thousands of times. The order of adjectives, according to the book's author Mark Forsyth, has to be: opinion-size-age-shape-colour-origin-material-purpose. 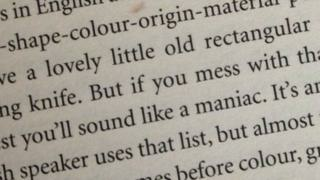 "If you mess with that word order in the slightest you'll sound like a maniac, he warns in the extract. "It's an odd thing that every English speaker uses that list, but almost none of us could write it out. And as size comes before colour, green great dragons can't exist." Along with the screengrab of this advice, Matt posted the comment: "Things native English speakers know, but don't know we know." Try it for yourself. Here's mine: a lovely thick black coat. It can't be a "black thick lovely coat". Whoah! (Matt told BBC Trending that is the most popular digital response he's had to the passage). Explaining why he tweeted the adjective advice, Matt said: "I am a grammar nut - some have even said a grammar Nazi. But that's because I'm interested in languages and how they work - not just in terms of the rules of grammar and syntax, but also style and what makes good writing. So things like this are right up my street, but until now I had thought that most people don't really care. I'm glad to be proven wrong." They most definitely do care. Some have tweeted Matt with the simple words "Mind Blown". Matt told BBC Trending: "I think in English there are a lot of rules like this that we don't know. We're lucky that, as native speakers, we can just open our mouths and it comes out. French and German speakers are a lot more interested in the mechanics of their languages - they'll argue about grammar and go and get Le Bon Usage to settle a dispute. Among English speakers, this almost never happens." Matt says the reaction to the tweet has been largely "amusing" and that not all agree with the rule. He's seen people resort to creative ways to try to disprove it. One author tweeted: "Start and end the same, but the middle is different and apart from the 'little' I wouldn't say any of it feels definitely wrong." We'll let you decide if you think "lovely old French green rectangular little silver whittling knife" works or not. Mark Forsyth, the source of Matt's much-shared adjective advice, is not surprised that people are so interested with the intricacies of how we express ourselves. "I knew that there were a lot of language fans out there," he told BBC Trending. "I think what fascinates people about language is that in one sense it's so familiar, we use it every day (unless you're a lighthouse keeper); but we don't know that we know so much about it. Whether it's the odd rules about the order of adjectives or ablaut reduplication, or the bits of etymology that are utterly obvious once you point them out." "That's essentially what I do in my books - I point out the things that are right in front of you."